I guess that should come as no real surprise following last week’s post, but this time I actually have gutters on my mind, not deformed produce. Ever since we built the coop, we’ve been planning to install gutters on it in order to harvest rainwater for the vegetable garden (which lies directly behind it), but with a never-ending to-do list, and a reluctance to spend money unless absolutely necessary, it has taken us almost 3 years to finally get around to it. 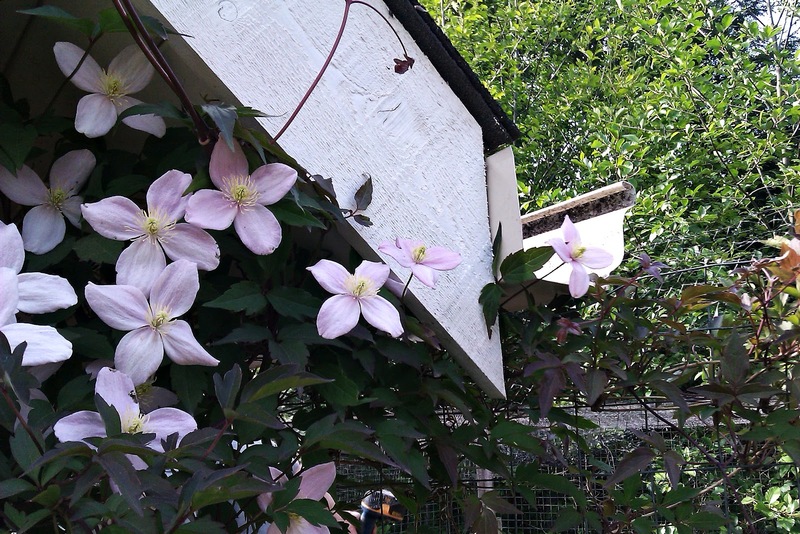 The Montana clematis is doing a fine job of covering the coop and run in sweet-smelling pink blossoms. It seems that this is another good example of how sometimes putting off a project pays off, because my mom and step-dad ended up replacing the gutters on their house last fall, and were able to save us two coop-sized lengths and assorted downspouts. Which means this project meets my two favourite criteria: recycled, and free. We still have to cap off the front ends, but the gutters are already hard at work, filling the barrels with late spring rain. It would really be good to have a gutter and downspout it can serve dual purposes: a.) it can help massively in saving rainwater and; b.) it can help prevent water damage over time, thus saving you from the pains of spending on repairs for the house. It’s like hitting two birds with one stone!